Amazingly enough, many pieces of our Corelle dinnerware survived the hurricane. 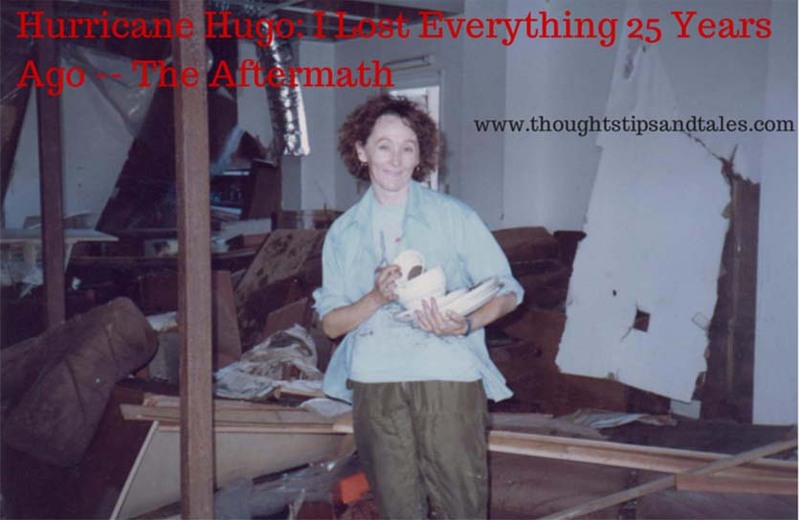 I began the tale of Hurricane Hugo and how it destroyed all my family’s possessions yesterday. Here’s what happened after that. Since we were only allowed a few hours on the island, we packed our trash bags — mine contained renter’s insurance info and other paperwork from the file cabinet (still intact but waterlogged) — and trudged back to the ferry in shock. My son and I returned to my parents’ condo, and several weeks later, we rented a furnished house about an hour away from Sullivan’s Island, since all rental property surrounding Charleston was overflowing with displaced residents. In the following weeks, we were able to take a ferry back to the island several times to get additional items, searching for our possessions on the debris-filled streets near the house. We found a few of our things, dirty and wet, in ditches along the side of the road blocks away from the apartment. In my hunger to have something left from our former life, I hauled these random items to our temporary home and spent weeks trying to clean and salvage them with bleach and elbow grease every day as my son napped. When I filed a claim for renter’s coverage on our property, the insurance company refused to pay a cent, saying that the damage was from water, not wind — and that the water mark on the apartment wall was at six feet. We had no possessions and no insurance reimbursement for damages. Fortunately, members of my church gave us $1,500 to buy the bare necessities — beds and a couple lamps — and we got a coupon for $300 of clothing from FEMA. A friend who’d moved right before the storm mailed me a big box of gently-used clothes, which I wore gratefully for a year (the three sets of clothes I’d packed when we evacuated had gotten very tiresome). My best friend from junior high sent us a $100 check, which I know was a strain for her and her husband– but we greatly appreciated it. My little family moved several times after that, eventually returning home to our remodeled apartment on the island a year after the hurricane. The blessings that resulted from the hurricane were experiencing the kindness of friends and family, and finding out that material things aren’t really important. You can lose it all and go on to have a happy life. This entry was posted in hurricane, hurricane hugo, thoughts tips and tales and tagged hurricane, hurricane hugo, lost everything, recovery after a hurricane, thoughtstipsandtales. Bookmark the permalink. aww. i like how you ended this, with your last paragraph. it sums it up so well. thanks for sharing about your experience; the photos give so much background to the story, but the lessons you learned from the hurricane are invaluable.